TEST TRACK NOW with Added DCC facility. ​This Is one of our Group's MAIN ASSET's. Why not bring your latest model along for a running session? Spring and Summer seasons coming up for all Gauge O modellers, those who have layouts outside will be dusting off the leaves and getting the tracks level after the winter period. Our Exeter Gauge O group is still meeting regularly twice a month at the Victory Hall in Whimple EX5 2TS, which is quite close to the M5 and Exeter junctions. Our membership spreads far and wide over Devon, from Brixham in the south to Seaton in the east and Cullompton towards Somerset. Anyone who would like to come along please feel free to visit us for one of our meetings. News is we have a New Chairman Byron Williams modelmaker extraordinaire, he was duly elected in March 2019 after both he and the outgoing Chairman were both reminded they had to Pay their subscriptions before they could place their vote! Byron was elected unanimously so we don't have any 'indicative votes' to get through in our government! We also elected a new Treasurer after John Cavell decided to step down due to his other committee commitments for other Model Railway groups plus his other interests. Paul Beatty stepped up to the bench for his stint at the financial helm. We are in a healthy position both from a membership point of view and money in the kitty now the 2 Chairman have released the moths from their wallets! We are a diverse group from Narrow gauge to Finescale Standard gauge with most pre-nationalisation and BR represented on our test tracks. We see most of the Heljan new issues as Brian brings the preproduction painted samples along for a good run on our test tracks. See pictures in the Gallery. Many of our modellers are building kits quietly at home, and bring their steeds along to test them out. Best regards Chris Ward. February 2019 AGM over and done with! A new Treasurer steps in, Paul Beattie takes over from John Cavell who has done a sterling job over the last few years to keep us on the straight and narrow. We had news of possible refurbishment changes to the Victory Hall (our regular meeting haunt). We have compiled a report to go to the Hall committee from our point of view, after they had asked us for feedback as a regular user of the venue. Also discussed were the possibility of livening up the meetings we have, to include more demonstrations etc. 'White metal soldering' Brass kit building, Scenery applications etc. These will now start to appear in our diary of events. Bring along your own small toolbox and that kit you have in a drawer to finish it off ready for our Model Competition night in October. Date for the annual Day trip to the West Somerset Railway will be sorted and information on the day will be forthcoming soon. Contact Roger Hill if you and your family members or friends would like to come along, its a free and easy day, the more that come the merrier. The AGM was a long one but lots of subjects needed to be talked over and finalised, taking into account many views of members. All good News for our long term future as a premier Gauge O group in the South West!! Come and discover our friendly welcome, visitors welcome. Our December meeting was well attended. See the picture gallery for some Loco's and the needle in a haystack hunt for a small brass part! ​The Christmas meal was attended by some 16 members at the new venue, the Half Moon Inn, I believe all were pleased with the evening. We have steadily increased our members over 2018, and now have over 40 fully paid up subscriptions. Looking forward to Christmas and the New year, thank you to all our members who come along every two weeks or so, and contribute to the smooth running of our group, and keep it as a friendly place to come and have a chat and joke or two, while enjoying our hobby. 14th November. 100 years of remembrance for WW1 has just passed, some TV programmes have had glimpses of old Railway film, not least the Narrow Gauge systems used to transport People and Goods to and from the Front lines, what a Job! Onto brighter subjects, we put on a good display of members stock at the Thorncombe Exhibition on the 10th of November, see Dave T's pictures on the gallery pages, Paul Beatty's Avalon Halt was in fine form, showing what can be done in a small space in Gauge O, all run by DCC. We also had our Area Rep winning the Chairmen's Award for his N Gauge rendition of Brixham Bay. Well done Kevin & Judy! Byron & David F were showing Kit building. David F actually managed to get some work done soldering his brass kit. John C, brought along a small demo system for the DG Auto uncoupling and delayed (for shunting) coupling. Barrie is pictured demonstrating this (or is he just practising)? Our meetings are being well attended. Keep an eye on the Web site diary for up to date events. 4th Oct, We held our annual Modelling competition evening & bring n buy sale what a busy evening with lots of really good quality models on display, the pictures from the competition are in the diary section on this web site. It seems this maybe the last visit from one of our members Martin Philpot who is moving onto to pastures new. Martin is & has been a very active member and will be missed especially on the narrow gauge sections where he has contributed enormously. 16th August we had two Minerva Pannier tank Locos running around our test track, one fitted with the Deltang Battery powered R/C system the other fitted with the Protocab Battery powered R/C system. Very interesting to compare side by side the two systems fitted to the same model Locomotives, both had the entire system fitted within the Bunker area, including the battery. Following your invite I attended the ExeterG0G Open Day along with my friend John Merefield who owns the 0 gauge layout Bodmin North which I help him exhibit. When I tell you that we arrived at about 10.30 and did not go home until well after 3.00 you will gather that we had a good time. An eclectic mix of layouts and models, particularly on the test track with a great friendly atmosphere and spectacular cakes.. Although only a modest affair I think we enjoyed the event more than some full blown exhibitions we have been to! After the three meetings in June, and the Open Day, (not to mention the heat) anyone can be forgiven for a certain amount of "Meeting Fatigue" setting in, the result of which was a grand total of EIGHT of us turning up last Thursday! We all felt pretty shattered and couldn't be bothered to set the layout up, so we sat around enjoying tea and flapjacks, before making an early departure to the pub. Thanks very much to everyone who came along to man the stand at the Exeter Show over the weekend, particularly Byron, Barrie, Chris and Trevor who did both days. Tony P was also there both days, wearing his SWOONS hat (or shirt) on Saturday, and ExeGOG on Sunday. Our stand at the show seems to get bigger every year, with Byrons's military models, the new display shelving, and the radio control demo taking a large space. With Kevin and Mrs Kevin alongside with the Gauge O Guild and Kevin's own models, our display seemed to be longer than most of the layouts! Looking ahead, please remember that we only have ONE meeting in July, on Thursday 19th, due to the hall availability. We welcome to the Group our latest member, Andy Mullins, former owner (and originator) of Branchlines. He has been coming along to recent meetings, and I think most of you will have met him. So following on, please find attached the latest Membership/Contact list, No.3. And as normal, please delete/destroy the previous list(s) and ensure that if you are emailing the whole group on group business, that it goes to all members and only to members. A really interesting presentation of Not just the Trams of Melbourne, but a comparison between Sidney and Melbourne, some background on reasons why Melbourne has such a comprehensive network, plus lots of data and then some interesting videos and still shots of both cities. The first meeting in march was cancelled due to the weather. Snow and road closures etc. March 15th a DCC demo of members DCC controllers, follow up from the AGM, do come along to see options available. January, was the first meeting of the new year, great support from members again, plenty of variety on the test track etc. The first meeting in February, will be our AGM, dont be put off these dont last long! !, we will be having a discussion (After tea & coffee) on the progress of our open day planned for June this year. Nothing onerous just bringing you all up to date. December-2017 three meetings this month which included our Christmas Dinner evening. ​Our own Test track maintenance is taking place over these few meetings, but dont let that stop you bringing along the New model in your collection to run it in! Planning is going well for Our Open day in June 2018, so please dont book a holiday to include that date, you will be asked to come along for the day and help. Stewards, Layout operators, Car Parking, Washing up, clearing tables, etc. Please be prepared to assist. July-2017 Our Newly elected Area Rep for the Guild is Kevin Cartwright. New plans for the 2018 OPEN DAY are well underway, Test track revamp to be planned and a start made, curtaining etc. ​Graham Tombs has agreed to put on an Illustrated Talk about the Khyber Pass, this is highly recommended not to be missed in April 2018, watch the diary for more information. Kevin Cartwright was duly elected by a majority vote to be the South West area Representative for the Gauge 0 guild in June 2017. Kevin is one of our members, and is looking forward to getting to see the Groups in the South West as time permits. WE MUST THANK, Byron, Trevor, Barry, John and David plus all the other members who helped man the Exeter-GOG stand at the Exeter model railway show July 1st & 2nd at the Marsh Barton (Matford) centre. 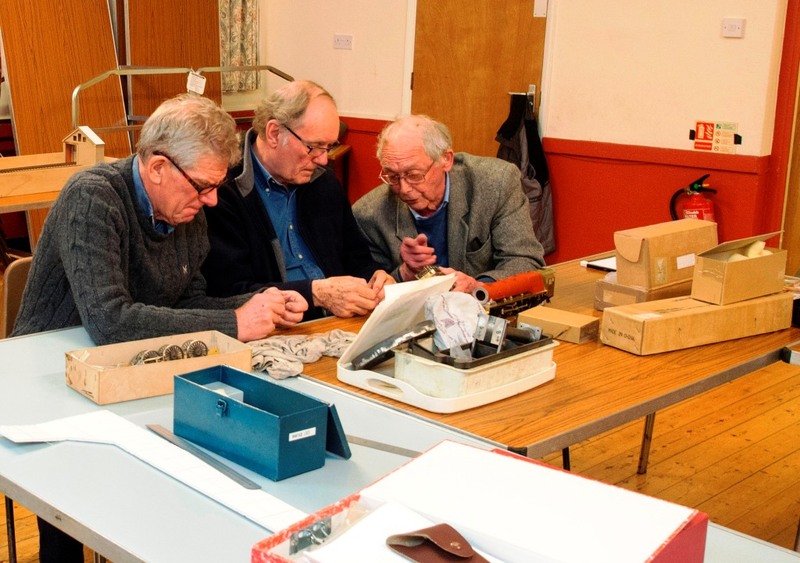 In the end we had 4 tables of display, kit building, + John's Traverser Layout (Wagon Works) & on Saturday at least we had the Radio Control and new coupling ideas table set up by Barrie & Roger. A good presentation of what our Friendly group gets up to, (Byron didn't get much kit building done as he was constantly on his feet explaining the virtues of our group) A great weekend for those who missed it. Some good 0 gauge layouts on show as well. June-2017 Competition Evening, results on Comp Evening page, pictures added to Gallery. At the recent AGM one is always careful with ones arms but mine went up at the wrong time, so baton has been passed to me from Chris Ward, He has gone on to greater things and has found himself as chair to our wonderful group. Chris is also our webmaster and the site continues to grow with additions to the member’s layout and tips n Tricks pages being most interesting. Our two sessions each month, usually the first and third Thursdays at The Whimple Victory Hall, EX5 2TS have been very well attended in the New Year with around 30 members out of a total of 35. Much better than most clubs which says it all about the passion we all have for modelling gauge 0 and gauge 0 narrow gauge. Our test track covering from a scale 2 foot to standard gauge is so well used on club evenings that it will need some further maintenance during a forthcoming set of club nights. Further details are on our website at www.exeter-gog.net. In May, we are planning to open the hall with some small layouts to show what we achieve. This is on election day so will be interesting to see how many pop in to see our work! We continue to grow and we are looking towards the 40 members mark with 37 now paid up with several joining in the past months, Gauge 0 in Devon is very much alive and well. Another popular feature at the meetings is either watching or participating in building or repairing models and this photo says it all. Such discussions are just not possible any other way and help us all to achieve a better standard. The 4th Quarter group report, some extra pages have been added to our Group Web site, showing a few pictures of some of our members layouts. These vary from small Dioramas 4 feet long to round the Garden and down the length of the house to Round the Loft and back, or some Garden & Summerhouse track work. One shown belonging to Pete features some great work on a Pier with Paddle Steamer in situ. For the first time we held two meetings in December a good addition to our calendar of meetings. It is on the cards for early next year to have a Navvy Session on the Test Track, to help with baseboard joints and contacts etc. This is a very well used item in our group. A couple of extra web pages include a Tips n Tricks page, and the latest addition is a For Sale and Wanted page. Our membership has increased nicely this year to 35+. We have welcomed at least 3 new members since the summer. As an affiliate group to the 7mm Narrow Gauge Association we also Welcome any members to our meetings. The 3rd Quarter group report, back after the summer recess (where have we heard that before, no talk of Brexit here) New Heljan Diesels on show, Trevor and David (Peco) bringing along samples for a run round the test track. Earlier in the year we had a very successful weekend at the Exeter Model Railway show with the Exeter GOG display stand, lots of chatter and encouragement for visitors to consider Gauge 0 scales. Also John Day attended with the Scale Seven demonstration of track building etc. Some lovely Layouts for 7mm scale were on show. Thanks to those who sat down for a while at the Stand & gave them a break to enjoy a trip around the show. Chris had his small NG Collyweston Layout running for 2 days on the Swoons Narrow Gauge area, to fill in for a layout that didn't turn up! Several of us attended the 60th Anniversary at Telford to spend the hard earned pennies saved up all year. I am sure our Test Track will be bustling with new Locos and built up kits over the next few months. Byron & I Travelled up with Trevor to experience his “Superb Skoda” driving. The 2nd of my group reports, I apologise for missing the Gauge 0 News August Issue, reason I was in the middle of the sale of our 3D printing business. Apologies. What I was going to start with is the News we have passed the 30+ Members of our group, the meetings are going well and consistently attended at the Community Hall in Whimple near Exeter. We have members travelling from far and wide 30 miles + to come to meetings, Car sharing is possible, get in touch if you need to team up. A very successful weekend at the Exeter Model Railway show in July with the Exeter GOG display stand, lots of chatter and encouragement for visitors to consider Gauge 0 scales. Also John Day attended with the Scale Seven demonstration of track building etc. Some lovely Layouts for 7mm scale were on show. I am sure Byron, Trevor, Ian etc, had a good time and thanks to those who sat down for at the Stand & gave them a break to enjoy a trip around the show. Please keep your eye on the www.exeter-gog.net for our latest diary of meetings or email exeter.gog@gmail.com for more information, Dates of future meetings etc. January 7th meeting the first meeting of the year. 24 members Inc. 2 visitors who were made welcome. John n John! The OVAL club test track was put up with the usual which end do we put here? It is Oval so should not present a problem! Eventually it was all up and running with a good selection of stock by members. On the test track various Locos & stock were circling along with Chairman Byron's German WW2 track ripper being towed around. Thankfully not working as it was designed to. Otherwise all the good work on building the test track would have been torn apart. A land mark was Made during the evening. The 0-16.5 Narrow gauge circuit was all joined up, making this into one of the longest NG tracks your scribe has seen. Length in scale terms its probably longer than a scale version of the Ffestiniog railway. We have now become an Associate Group of the 7mm Narrow Gauge Association with the benefits for Local members of that association to come along and Join us. Modeling tables were set up with track building. Wagon plastic kit assembly, Etched brass brake van assembly all taking place. It was good to make them welcome. Notice the drop in numbers from Jan to Feb, AGM fright I guess. The AGM decided amongst other things that our First Open Day in 2015 was a success, and lessons learned, we will be staging another one in 2017 IE bi annually. Our estimable Chairman Byron Williams who has given so much over the last 4 years decided with home & work commitments that it was time to have a rest for a short time. If we know Byron he will still be active and willing, for example he volunteered to carry on with the Publicity Stand and 'fix it clinic' at the Exeter MRE which is in July 2016. Secretary David Taylor & Treasurer Richard Hensman both were happy to stay in their respective posts, thank you both. A new position was set up that of 'Competition Organiser' Keith Gowen stepped up for that one. Our annual modeling competition is usually well supported and along with the Martin Philpots Diorama Prize should be worth seeing in May this year. Get your Scenic kit to work! We still had to have a tea / coffee break before resuming discussions on who was going to volunteer to be the new Chairman. in the end it was decided to defer to a 2nd meeting in February, since then we have had 2 volunteers, Peter Holcombe stepped up. A new Chairman at the helm. We have decided to run more regular meetings in most months. So please keep your eye on the www.exeter-gog.net for our latest diary of meetings and events. Dates future meetings All welcome to join us. At the end of June we held, with some trepidation, our first open day. The principle intention was to show the local inhabitants what we do in their village hall every month. When we had to leave our old headquarters, at rather short notice, we were fortunate indeed to settle on Whimple’s village hall. Because we are a widespread bunch geographically we need a location that we can all access reasonably easily, and the village hall, with its excellent facilities, fits the bill admirably. We were able to provide a couple of micro layouts, the test track and some dioramas by way of entertainment, and people of all age groups came and seemed genuinely interested. Indeed a couple of potential railway modellers emerged from the pack. We were also pleased to welcome members from other local modelling groups, in particular from the Dawlish, Exeter and 72A clubs. Member’s wives were heavily involved and ensured that the draw and catering were managed extremely efficiently, and their efforts were really appreciated! Overall the event went very well and we hope to repeat it sometime in the future. At the August meeting we were delighted to welcome the distinguished railway artist Eric Bottomley and Broad Gauge guru Amyas Crump. Eric is wrestling with the delights of installing dcc on his new highly scenic layout, while Amyas is contemplating using his encyclopaedic knowledge of all things Great Western into some 7mm models. With the new test track pretty well completed, apart from one of the narrow gauge lines, I would like to report that it’s erection at club nights is now like watching a well-oiled machine at work. However! Putting up the 16 numbered baseboards and corresponding support legs is providing an interesting challenge, and watching the erection process with half a dozen members behaving like demented bingo callers is an entertaining experience. Much more entertaining, I have to say, than actually helping them! Our regular meetings are held at the Victory Hall, Whimple (in East Devon) on the first, and usually middle, Thursday of each month. Visitors and potential new members (excellent value at only £20 a year by the way!) are always very welcome to come and play trains with us, or even do some modelling. Talking and drinking coffee or tea are, of course, mandatory! For more information please email exeter.gog@gmail.com or visit our embryonic website at www.exeter-gog.net for confirmation of the dates of our meetings. Those of us who knew him were saddened to learn of the death of David Goddard. ‘God’, as he was affectionately known, was a founder member of the Group and a very active member for many years, until sadly ill health curtailed his involvement. He will always be remembered for his enthusiastic and committed approach to Group projects; not to mention his idiosyncratic driving style! He had a large collection of unmade Finney and Mitchell loco kits – numbering well over 30 at the last count. ‘Oh it will only take me a couple of weeks to knock one of them out when I retire’, he used to say, but sadly fate has prevented him from putting his optimism to the test. He will be greatly missed by his many friends. The annual modelling competition in May brought out its usual array of excellent models. Prize winners, in no particular order of importance, were Jim Calverley, Richard Hensman, Pete Holcombe and Martin Philpott, with Jim, Pete and Martin rather hogging the limelight with 2 awards each. Martin had generously donated a cup for the best diorama, which was competed for the first time this year, and which attracted several entries. Pete (‘limalout’ to his forum friends) was the inaugural winner with his excellent model of a rail pier head, complete with ferry. Pete’s approach to modelling is to make use of any odd materials he can lay his hands on, rather than resort to expensive kits, and very effectively he does it too! The picture shows, from left to right, Jim, Pete, Richard and Martin clutching their well deserved awards. Also on display were some of David Malton’s minute narrow gauge models. Although they didn’t win any prizes this year they are excellent models and can be seen featured in his article ‘Abbey End’ in the June Railway Modeller. The Peter Goodwin Cup for the best overall model fittingly went to Jim for his superb model of an Ivatt ‘Mucky Duck’. Peter was responsible for setting up the Group when he retired to Devon in the early nineties, before sadly passed away a few years ago. Jim had been great friends with him at the Manchester MRC but lost touch when Peter moved South. Jim, having later followed Peter’s path South in retirement, hadn’t previously realised Peter’s involvement with the Group, so winning this award somehow seemed very appropriate. I have been asked by several members to point out that Chairman Byron didn’t win anything in the competition this year. And great was the wailing and gnashing of teeth…. Our regular meetings are held at the Victory Hall, Whimple (in East Devon) on the first, and usually middle, Thursday of each month. Visitors and potential new members (excellent value at only £20 a year by the way!) are always very welcome to play trains with us or even do some modelling. Talking and drinking coffee or tea are just as popular! For more information please email exeter.gog@gmail.com or visit our embryonic website at www.exeter-gog.net to see what we get up to. There was a large turnout at the January meeting with almost all members in attendance – apart from me! David Malton brought along some of his minute narrow gauge creations; so small in fact that one member was heard to remark that he could hear it but not see it. But as said member has never heard anything, (at least not at the first attempt), in living memory this story is surely apocryphal. In February, 20 members attended the annual snoozefest, otherwise known as the AGM. The good old days when these meetings were finished in less than 20 minutes have long since gone and sadly they now seriously eat into our train playing time. To be fair, there was much to discuss this year. First up was a revised and updated copy of the rules and constitution. The item came as a big surprise to most members who had no idea there were any rules, let alone a constitution. This is largely because one of the endearing features of the group, apart from its friendliness, is its unwavering commitment to informality. Anyway, Secretary Taylor had tracked down the one extant copy of the document and burnt the midnight oil making it relevant to the 21st century. If only he could do the same for the members. In the last report I waxed lyrical about Byron Williams’ efforts as Chairman (I’ll do anything for half of shandy) and how his term of office had to come to an enforced end. However, the new constitution allows him to stay on in the role and he was quickly and unanimously re-elected for a further 12 months. Good news for us, bad news for him! Bad news also for Dave Taylor and Richard Hensman who were bludgeoned into carrying on as Secretary and Treasurer respectively. Martin Philpott has very generously presented a new cup to the Group for members to compete for annually by way of a diorama. I think we’ll all be very interested to see the entries for that one later in the year. It was also agreed that we should hold an ‘Open Day’ to give the parishioners of Whimple an insight into what we actually do in, or perhaps that should be ‘to’, their village hall. There were many different views on how to proceed with the idea and what we hoped to gain from it, so in best local government traditions a working party was set up. We await the outcome with baited breath. One of our members, Roger Hill, had his 15 minutes of fame when BBC Spotlight featured a video he had compiled of his father’s work on the Axe salmon trapping experiment in the 1950s &1960s. After such a relaxed and assured performance a television career surely beckons for Roger. We are all indebted to our 3D guru Chris Ward (www.cwrailways.com) who has dragged the Group in to the electronic age by setting up a Group website – see below for details. Our regular meetings are held at the Victory Hall, Whimple (in East Devon) on the first, and usually middle, Thursday of each month. Visitors and potential new members (excellent value at only £20 a year by the way!) are always very welcome to come and play trains with us. For more information please email exeter.gog@gmail.com or visit our embryonic website at www.exeter-gog.net to see what we get up to. October saw the annual Bring and Buy jamboree with more items appearing for sale than normal. And, in some instances at least, they were also of a higher quality. However, this didn’t prevent the customary attempts to palm off long held tat on unsuspecting friends. Now suspicious former friends in some cases, one suspects. The main thrust of the November meeting was finalising the commissioning of the new test track. A couple of large locos could be seen making their way tentatively round the outer circuit including Jim Calverley’s excellent model of a Duchess. At the other end of the size spectrum were the diminutive GWR ‘Trojan’ and Frank Battersby’s LNWR ‘Coal Tank’. Hopefully the inner circuit electrics will be completed by now and that should be fully operational as well. Minor outstanding niggles include board alignment, on a couple of boards, and perhaps more significantly, protecting the whole shooting match from damp whilst it’s stored in its concrete shed outside the hall. All of which means that our loan of the Yeovil MRC test track is coming to an end. It’s sustained the Group brilliantly since we had to vacate our previous HQ at fairly short notice and abandon our old extensive layout. It’s provided a focal point for club nights and enabled members to play trains to their hearts content. We can now return it to them with our very grateful thanks. The December meeting was the annual knees up at that excellent hostelry The Thirsty Farmer, conveniently situated next to the village hall where our regular meetings take place. 14 members, rather less than usual, partook of an excellent meal and a very convivial evening was had by all. Andrew Fiderkiewicz and Martin Philpott yet again came dressed as penguins, and after a few drinks Andrew’s walk bore an uncanny resemblance to one as well. There was also some very childish behaviour involving a sprig of holly – I must remember not to sit next to Dave Taylor next year! Chris Ward (www.cwrailways.com) kindly produced very detailed 3D models of fire extinguishers as a Xmas present for everyone, although it needed very good eyesight, or a magnifying glass, to fully appreciate them! It was good to hear that Rod Wilson, of Ramchester fame, is back modelling after his recent triple by-pass heart operation and we look forward to seeing him again soon. The accompanying photograph shows Group chairman Byron Williams, a committed technophobe, staring suspiciously at a silver ‘thing’ being pointed in his direction. Byron’s 3 year term of office is about to end, and a very successful period it’s been too. We all owe him a big debt of gratitude for the enthusiastic way he’s taken the Group forward. He’ll be a hard act to follow!